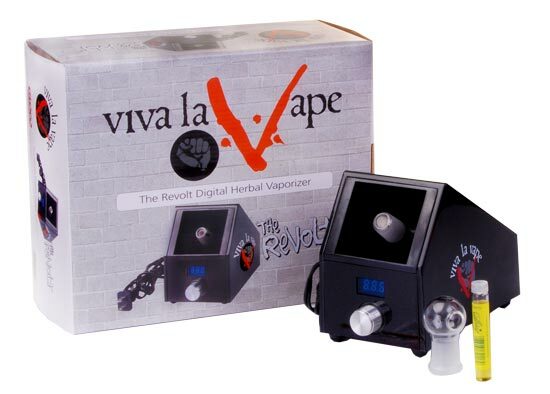 Viva La Vape Revolt is a dual function vaporizer that is able to vaporize dry blends, essential oils, and e-juices with ease. Viva la Vape is hands free Desktop vaporizer employs an effective Glass Ceramic Heating element, this has surpassed all previous box style direct inhalation vapor systems. Viva la vape is a nice glass-on-glass herbal vaporizer system. The Revolt contains a digital thermostat control for optimal performance and temperature control. Ground Glass Technology (GGT) allows the vapor whip to rest on the unit allowing a hands free vaporizer experience. The Revolt was designed with a replaceable fuse so that surges or electric fluctuations wouldn’t burn out the Revolt’s on board, so expands the life span of the unit significantly..
Comes with a hands free glass whip. Temperature adjustable up to 400 degrees Fahrenheit. Gets ready for use within minutes and easy to use. Comes with five replacement screens. Completely inert and very long lasting, the Revolt Digital Vaporizer allows you to benefit from the natural essence of your blends. For people looking for a dependable, long lasting, affordable vaporizer this is definitely a good option. This vape will definitely extract the essence of your biomass and provide you with a top of the line aromatic experience.